Similar to mySQL, postgreSQL is very famous and feature packed free and open source database. Earlier we’ve discussed several installations including LAMP stack installation, Apache2 installation from source, PHP5 installation from source and mySQL installation. In this article, let us review how to install postgreSQL database on Linux from source code. From the postgreSQL download site, choose the mirror site that is located in your country. You may encounter the following error message while performing ./configure during postgreSQL installation. Install the readline-devel and libtermcap-devel to solve the above issue. After the installation, make sure bin, doc, include, lib, man and share directories are created under the default /usr/local/pgsql directory as shown below. Create the postgres data directory and make postgres user as the owner. Before you can start creating any postgreSQL database, the empty data directory created in the above step should be initialized using the initdb command as shown below. Make sure all postgres DB configuration files (For example, postgresql.conf) are created under the data directory as shown below. 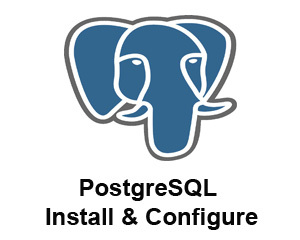 Use the postgres postmaster command to start the postgreSQL server in the background as shown below. Create a test database and connect to it to make sure the installation was successful as shown below. Once you start using the database, take backups frequently as mentioned in how to backup and restore PostgreSQL article. Thanks for your comment. I’m glad you found this guide helpful. Refer to our PostgreSQL DBA Commands article that explain how to setup postgreSQL service and restart it. This easy rundown served me better than the official documentation on postgresql.org–at least for getting a testbed up and running quickly. Thank you. For Ubuntu 9.04 through 10.10 I had to sudo apt-get install readline6-dev. so I want to uninstall the the postgresql, please tel me the steps. I download “postgresql-9.0.4” and cross-compile for my embedded board. Every things works fine till Step 8. It shows that ‘/tmp’ is full, but ‘/’ is 2.8G free. I install all the FS on 4GB SD card. How to remove( completely ) postgresql, if I have installed and configured the PostgreSQL server according to your post above ? Thanks, very nice tutorial. For Linux Mint 12 (so probably Ubuntu 11.10 also) I also had to sudo apt-get install readline6-dev as mentioned above for older versions. I have installed postgres 9.0.7 on my linux server and I can run the regression tests against the installed instance locally on my server. Next, I want to run this regression test against a remote machine which has my DB and app installed. Can someone tell me how I can run the regression test, where I have to make changes in configuration to run the test suite against remote host? Excellent post — clear, relavent, and concise. Extremely useful. I can’t execute certain commands because I’m not getting authenticated as a root user…What should i do then? Hi i have tried to install postgresql 9.2.4 from source tar.gz , after ./configure while im trying to make it as for gmake even after gmake installed its shows some error such as refer to INSTALL Document .. is there any other steps want to follow , is it differ from this posting steps ? Thank you for posting this. Saved me a lot of time. Worked perfectly. failure. It is possible the compiler isn’t looking in the proper directory. Use –without-readline to disable readline support. hey i am trying to install postgres into my xubuntu and am etting the following error how do i correct it? this is the first instruction I found that works. Just what I need, thank you for the clear and concise information. How about making the rpm from the source code?